1Department of Pharmacology, PES College of Pharmacy, Bangalore-560050. 2Department of Pharmacognosy, PES College of Pharmacy, Bangalore-560050. 3Department of Pharmaceutical Chemistry, PES College of Pharmacy, Bangalore-560050. *Address correspondence and reprints request to: Gollapalle L. Viswanatha, Department of Pharmacology, PES College of Pharmacy, Bangalore-560050. Viswanatha GL, Janaki Priyadarshini B, Hanumanthappa S, Rangappa S, Janardhanan S. Synthesis and Anti-hyperlipidemic Activity of 3H-benzo [4, 5] thieno [2, 3-d] [1, 2, 3] triazin-4-ones: Possible Mechanism of Altered Lipid Metabolism. Oman Med J 2012 Sept; 27(5):388-395. Objectives: The present study was aimed to evaluate the anti-hyperlipidemic activity of newly synthesized tricyclic benzothieno 1, 2, 3-triazine derivatives namely CP-1 (3-(methyl)-5,6,7,8-tetrahydro,3H-benzo[4,5] thieno [2,3-d][1,2,3] triazin-4-one), CP-2 (3-(ethyl)- 5,6,7,8-tetrahydro,3H-benzo[4,5] thieno[2,3-d][1,2,3] triazin-4-one) and CP-6 (3-(2-chloro phenyl)-5,6,7,8-tetrahydro,3H-benzo[4,5] thieno [2,3-d][1,2,3] triazin-4-one) against dexamethasone and Triton WR-1339-induced hyper-lipidemia in rats. Methods: Anti-hyperlipidemic activity of the test compounds were evaluated against dexamethasone (10 mg/kg, subcutaneous [s.c.]) and Triton WR-1339 (200 mg/kg, intraperitoneal [i.p]) induced hyperlipidemia in rats. Results: Administration of single dose of Triton WR-1339 (200 mg/kg i.p) and dexamethasone (10 mg/kg s.c.) for 8 consecutive days to adult wistar rats caused severe hyperlipidemia characterized by marked increase in serum cholesterol, LDL-C, VLDL-C and triglyceride levels along with an increase in atherogenic index. Serum HDL-C levels were decreased significantly compare to normal control. Pretreatment with Atorvastatin (10 mg/kg, p.o. ), CP-1 (25 & 50 mg/kg), CP-2 (25 & 50 mg/kg) and CP-6 (25 & 50mg/kg) showed significant and dose-dependent protection against dexamethasone and Triton WR-1339-induced hyperlipidemia in rats by maintaining serum total cholesterol, LDL-C, VLDL-C and HDL-C levels within the normal range. Also, a significant decrease in atherogenic index was observed. The anti-hyperlipidemic effect of CP-6 was comparable with reference standard Atorvastatin. Furthermore, CP-6 was found to be more potent than CP-1 and CP-2. Conclusion: These findings suggest that CP-1, CP-2 and CP-6 possess significant anti-hyperlipidemic activity against experimental animal models of hyperlipidemia. Keywords: Triton WR-1339; Dexamethasone; Hyperlipidemia; Gewald reaction; Thiophenes; Diazotization; 1, 2, 3-Triazine-4-ones. The 1, 2, 3- triazines are a novel class of heterocyclic compounds and limited research dealing with thieno 1, 2, 3-triazines have been reported and the number of known compounds of this type seems to be limited. The present study was undertaken to synthesize and investigate some new benzothieno 1, 2, 3, triazines for their anti-hyperlipidemic activity.7 In a previous study by the authors, it reported about the anti-histaminic activity of three newly synthesized tricyclic benzothieno 1, 2, 3-triazine in both in vitro and in vivo models.7 With this background, the present study was undertaken to evaluate the anti-hyperlipidemic activity of newly synthesized tricyclic benzothieno 1, 2, 3-triazine derivatives in experimental animal models of hyperlipidemia in rats. The drugs used in the study included Atorvastatin (Ajanta Pharma, India), Triton WR – 1339 (iso-octyl polyoxyethylene phenol) (Sigma Aldrich, USA) and Dexamethasone Sodium Phosphate (Strides Arco Labs, Bangalore), biochemical kits (Enzokits, Ranbaxy, India). The solvents and chemicals used for the synthesis of thieno triazines and for biochemical estimations were of analytical grade and procured from local firms. Analytical TLC was performed on Silica plates- GF254 (Merck) with visualization by UV or iodine vapors. Melting points were determined in open capillaries on a Thermonic Melting point apparatus and are uncorrected. The IR spectra (KBr, cm-1) were run on Perkin Elmer FTIR Spectrophotometer. 1H NMR (CDCl3/DMSO-d6) spectra was recorded using Bruker AMX-400 with TMS as internal standard, MS spectra were recorded on (AMD-604) and Elemental analyses were performed on Carlo Erba 1108 elemental analyzer and were within ±0.4% of theoretical values. The starting compounds in the synthesis of thienotriazines were 2-amino-3-(N-substituted carboxamido)-4,5-tetramethylene thiophenes namely CP-1a, CP-2a and CP-6a, which were synthesized involving an adaptation of a well-known and versatile Gewald reaction involving three steps.8 Later, the CP-1a, CP-2a and CP-6a were diazotized to yield a series of 3 - Substituted amino-5, 6-tetramethylene thieno [2, 3-d] [1, 2, 3]-triazin-4(3H)-ones namely CP-1, CP-2 and CP-6, respectively. In this reaction, the starting compounds 2-amino-3-(N-substituted carboxamido)-4, 5-tetramethylene thiophenes (CP-1a, CP-2a, and CP-6a) react with NaNO2 in the presence of HCl to give the respective triazine-4-ones. The general procedure for the synthesis of 2-amino-3-(N-substituted carboxamido-/carboxanilido)-4, 5-tetramethylene thiophenes (CP-1a, CP-2a, CP-6a) included a mixture of appropriate active methylenic ketone (0.04 mol), substituted cyano acetamide/acetanilide (0.04 mol), ammonium acetate (2 g) and glacial acetic acid (2 ml) in cyclohexane (80 mL) was refluxed for 10 hours in a Dean stark apparatus with an arrangement for water separation. The reaction mixture was cooled, diluted with cyclohexane and washed successively with water and 10% aqueous sodium carbonate solution, and dried over anhydrous sodium sulphate. The solvent was removed under vacuum. The crude alpha (N-substituted carboxamido/carboxanilido) acetonitrile derivative thus obtained was employed directly for further reaction. To a mixture of the above crude intermediate, sulphur (0.04 mol) in ethanol (40 mL) and diethylamine (4.0 mL) was added drop wise with stirring. The mixture was stirred for 1 h at 45 -50°C, chilled overnight and the solid obtained was filtered and washed with ethanol to yield yellow crystalline solids. Recrystallized from suitable solvents, yield - 45-50%. 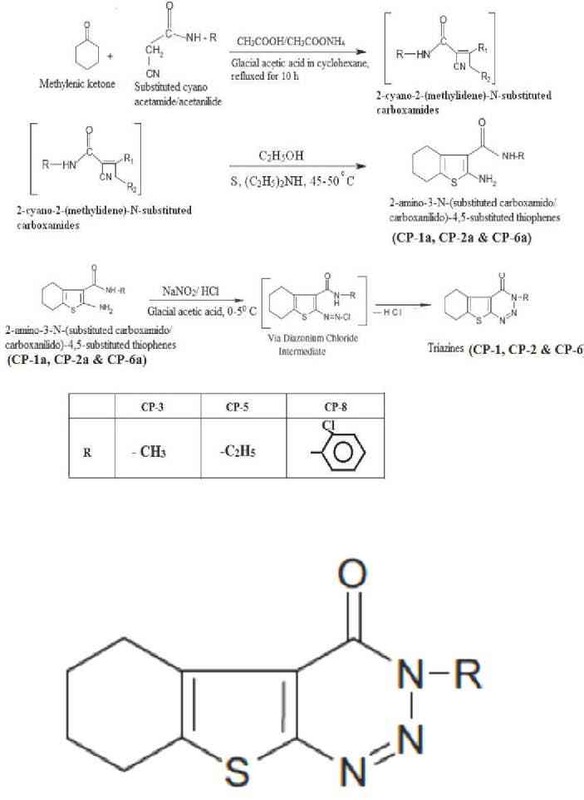 While the general method for the synthesis of 4, 5-tetramethylene thieno [2, 3-d] [1, 2, 3]-triazin-4(3H)-ones (CP-1, CP-2, CP-6) included a mixture of the corresponding 2-amino-3-(N-substituted carboxamido/carboxanilido) - 4, 5-substituted thiophenes (CP-1a, CP-2a, CP-6a) (0.01 mol) in 30 mL of glacial acetic acid was warmed until the starting material dissolved. The mixture was cooled to room temperature, 20 ml of concentrated HCl was added and the reaction mixture was cooled to a temperature below 5°C. To this mixture an ice cold solution of NaNO2 (0.03 mol) in water (25 ml) was added drop wise with constant stirring. Temperature was maintained below 5°C. The product separated as bright yellow solid, which was filtered, dried and washed with methanol to obtain pure triazines (CP-1, CP-2, CP-6). The synthetic route employed for the synthesis of the title compounds is outlined in Fig. 1. The physical properties and elemental analysis of CP-1, CP-2 and CP-6 are given in Table 1. Figure 1: Scheme for the synthesis of thieno triazines. Table1: Physical properties and Elemental analysis of CP-1, CP-2 and CP-6. M.P: 103 -105°C yield: 46%. IR max cm-1 = Ar-CH 3024.83: -Ali-CH 2978.54; Arom C=C 1506.46; -CO- 1660; (C-N) - 746.23. 1H-NMR (CDCL3): 2.2(s, 3H,-CH3), 2.8-3.0(m, 8H, tetramethylenic protons). MS (%) 221.06 (M+ 100.0%), 222.07 (11.3%), 223.06 (4.6%), 222.06 (1.9%). IR max cm -1 = -Ar-CH 3027.53: -Ali-CH 2988.42; Arom C=C 1505.46; - CO - 1682; (C-N) - 753. 32. 1H-NMR (CDCL3): 2.2 (q, 2H, -CH2), 2.0 - 3.0 (t, 3H,-CH3), 2.8-3.0(m, 8H, tetramethylenic protons). MS (%) 235.08 (M+ 100.0%), 236.08(13.3%), 237.07 (4.4%), 237.08 (1.1%), 236.07 (1.1%). IR max cm -1 = -Ar-CH 3098.35: -Ali- CH 2968.57; Arom C=C 1508.24; -CO- 1688; (C-N) - 773.42. 1H-NMR (CDCL3): 2.0 -3.0 (m, 8H, tetramethylenic protons), 7.45-7.6(m, 4H, Ar-H). MS (%) 317.04 (M+ 100.0%), 319.04(32.5%), 318.04 (18.6%), 320.04 (6.4%), 319.03(4.4%), 321.03(1.4%), 319.05(1.3%). Male wistar rats (200 to 250 g) were purchased from Bioneeds, Nelamangala, Tumkur, India. They were housed in a separate room in an animal facility at PES College of Pharmacy. Rats were maintained in polypropylene cages at a temperature of 25±1°C and relative humidity of 45% to 55% in clean environment under 12:12 hours light - dark cycle. The animals had free access to food pellets (Pranav Agro Industry, Bangalore, India) and purified water ad libitum. All the experimental protocols were approved by the Institutional Animal Ethics Committee (IAEC) at PES College of Pharmacy (No. PESCP/IAEC/03/2005-06) and were conducted according to the guidelines of CPCSEA, India. The experimental protocol involved acute toxicity studies. The acute intraperitoneal toxicity for the test compounds were determined in female, nulliparous and non-pregnant Swiss albino mice weighing 18-22g. After administration of different doses of test compounds, the mortality with each dose was noted at 48 hours (acute) and 14 days (chronic) as per OECD guideline no.425. LD50 was calculated using AOT425 stat program (http://www.oecd.org/dataoecd/17/51/1948378.pdf). The blood was allowed to clot for 30 min at room temperature and centrifuged at 5000 rpm; the supernatant layer (serum) was collected in clean centrifuge tubes and used for the estimation of serum cholesterol, triglycerides, HDL-C and LDL-C. VLDL-C and the atherogenic index was calculated using the previously mentioned formula. The acute toxicity study involving intraperitoneal administration of CP-1, CP-2 and CP-6 at 55 and 175 mg/kg dose levels did not show any toxic signs during short term and long term observation periods. However, at 550 mg/kg, i.p. dose, all the test compounds (CP-1, CP-2 and CP-6) produced 100% mortality during the short-term observation period. The LD50 value of all the test drugs was found to be 310 mg/kg. Table 2: Effect of CP-1, CP-2, and CP-6 on Dexamethasone-induced hyperlipidemia in rats. G1=Normal control, G2=Pathogenic control, G3=CP-1 -25 mg/kg p.o, G4=CP-1 -50 mg/kg p.o, G5=CP-2 -25 mg/kg p.o, G6=CP-2 -50 mg/kg p.o, G7=CP-6 -25 mg/kg p.o, G8=CP-6 -50 mg/kg p.o, G9=Atorvastatin -10 mg/kg p.o. († p<0.05, †† p<0.01, ††† p<0.001). 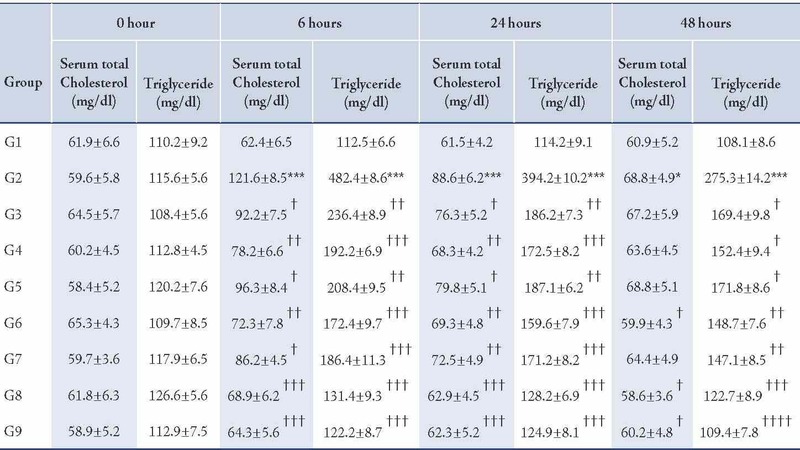 Table 3: Effect of CP-1, CP-2, and CP-6 on Triton WR-1339-induced hyperlipidemia in rats (Serum total Cholesterol and Triglyceride). G1=Normal control, G2=Pathogenic control, G3=CP-1 -25 mg/kg p.o, G4=CP-1 -50 mg/kg p.o, G5=CP-2 -25 mg/kg p.o, G6=CP-2 -50 mg/kg p.o, G7= CP-6 -25 mg/kg p.o, G8=CP-6 -50 mg/kg p.o, G9=Atorvastatin -10 mg/kg p.o. 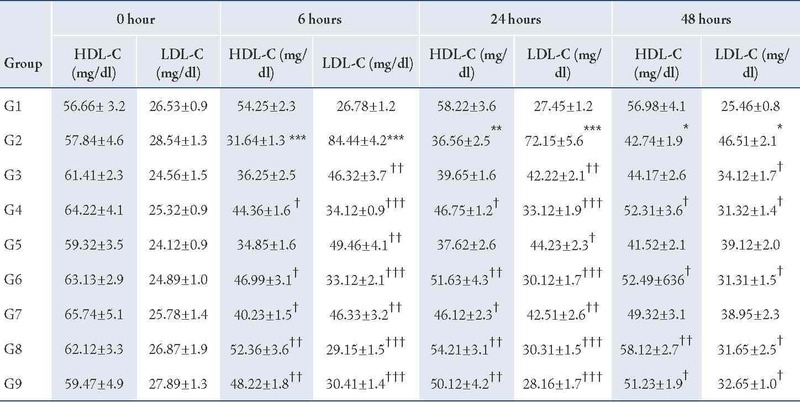 Table 4: Effect of CP-1, CP-2, and CP-6 on Triton WR-1339-induced hyperlipidemia in rats (HDL-C and LDL-C). G1 = Normal control, G2 = Pathogenic control, G3 = CP-1 -25 mg/kg, p.o, G4 = CP-1 -50 mg/kg p.o, G5 = CP-2 -25 mg/kg p.o, G6 = CP-2 -50 mg/kg p.o, G7 = CP-6 -25 mg/kg p.o, G8 = CP-6 -50 mg/kg p.o, G9 = Atorvastatin -10 mg/kg p.o. The values are expressed as Mean±SEM, (n= 8). * Pathogenic control vs. Normal control (*** p<0.001), † Treatments vs. Pathogenic control († p<0.05, †† p<0.01, ††† p<0.001). The higher dose (50 mg/kg, p.o.) of CP-1, CP-2 and CP-6 treatments showed significant protection against dexamethasone-induced elevated serum cholesterol (p<0.01), triglyceride (p<0.01), LDL-C (p<0.01), VLDL-C (p<0.01) and the atherogenic index (p<0.01) in a statistically significant manner and HDL level (p<0.01) was maintained within the normal range and all the estimated biochemical parameters of the treated groups were comparable with the normal control group. While the lower dose (25 mg/kg, p.o.) of the test drugs showed minimal protection; the effect of all the test drugs was dose dependent and statistically significant. Atorvastatin (10 mg/kg, p.o.) was used as a reference standard, it showed maximum protection against dexamethazone induced hyperlipidemia; furthermore, among CP-1, CP-2 and CP-6, CP-6 was found to be more potent and the anti-hyperlipidemic effect of CP-6 (50 mg/kg, p.o.) was comparable with Atorvastatin (10 mg/kg, p.o.). The Triton WR-1339-induced hyperlipidemia in rats by the administration of a single dose of Triton WR-1339 (200 mg/kg, p.o.) to wistar rats resulted in severe hyperlipidemia, associated with elevated levels of serum cholesterol (p<0.01), triglycerides (p<0.01), LDL-C (p<0.01), VLDL-C (p<0.01) and serum HDL-C levels (p<0.01) were significantly decreased from the normal levels; perturbances in all these lipid parameters resulted in greatly increased atherogenic index (p<0.01). The hyperlipidemia induced by Triton WR-1339 was prominent from 6 hours after administration and the altered lipid profile was slowly recovered to normal levels within 48 to 72 hours. Pre-treatment with newly synthesized tricyclic benzothieno 1, 2, 3-triazine derivatives CP-1 (25 and 50 mg/kg p.o. ), CP-2 (25 and 50 mg/kg p.o. ), and CP-6 (25 and 50 mg/kg p.o.) showed significant protection against Triton WR-1339 induced hyperlipidemia at 6, 24 and 48 hours by preventing the elevation of serum cholesterol (p<0.01), triglycerides (p<0.01), LDL-C (p<0.01), VLDL-C (p<0.01) and maintaining the HDL-C levels (p<0.01) within the normal range (Tables 3, 4, 5). The atherogenic index (p<0.01) of the test compound treated groups were significantly less than the pathogenic control. Atorvastatin was used as a reference standard (10 mg/kg p.o.) and the anti-hyperlipidemic effect of CP-6 (50 mg/kg p.o.) was comparable with Atorvastatin. Table 5: Effect of CP-1, CP-2, and CP-6 on Triton WR-1339-induced hyperlipidemia in rats (VLDL-C and Atherogenic Index). G1 = Normal control, G2 = Pathogenic control, G3 = CP-1 -25 mg/kg p.o, G4 = CP-1 -50 mg/kg p.o, G5 = CP-2 -25 mg/kg p.o, G6 = CP-2 -50 mg/kg p.o, G7 = CP-6 -25 mg/kg p.o, G8 = CP-6 -50 mg/kg p.o, G9 = Atorvastatin -10 mg/kg p.o. The values are expressed as Mean±SEM, (n=8). * Pathogenic control vs. Normal control (***p<0.001), † Treatments vs. Pathogenic control († p<0.05, †† p<0.01, ††† p<0.001). Hyperlipidemia contributes significantly in the manifestation and development of atherosclerosis and coronary heart diseases (CHD). Atherosclerosis is a common condition in both developed and developing countries and is now recognized to be an inflammatory condition leading to the development of ischemic heart diseases, cerebrovascular diseases and peripheral vascular diseases. Ischemic heart disease is a major risk factor in the pathogenesis of pre-operative adverse cardiovascular events which lead to significant morbidity and mortality within the high risk surgical patient population.13 The risk of CHD can be reduced by drugs which can lower the lipids and cholesterol levels. 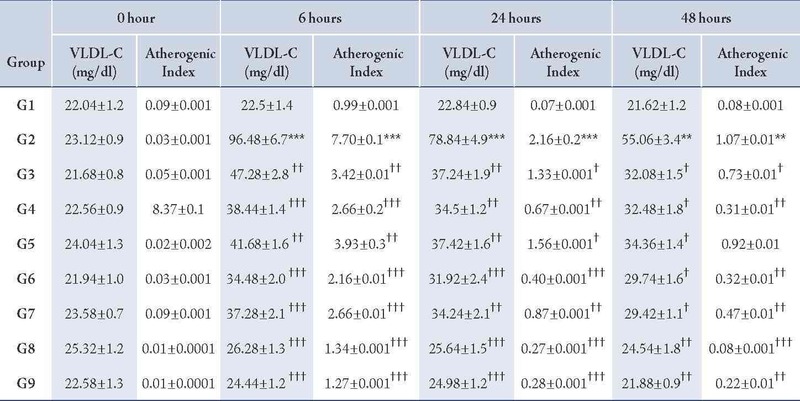 In the present study, dexamethasone (10 mg/kg, s.c.) administration for 8 consecutive days caused alterations in the lipid metabolism, which resulted in severe hyperlipidemia. Pre-treatment with CP-1, CP-2 and CP-6 offered significant protection against dexamethasone-induced hyperlipidemia by maintaining serum cholesterol, triglycerides, LDL-C, VLDL-C and HDL-C nearly to normal levels and the atherogenic index was found to have significantly decreased compared to dexamethasone vis-a-vis the treated group. Furthermore, the dexamethasone treatment has been reported to show an increase in free cholesterol along with the decrease in Lecithin cholesterol acetyl transferase (LCAT) activity in experimental animals.14 Co-treatment with CP-1, CP-2 and CP-6 inhibited the dexamethasone-induced alterations and thereby reduced the plasma free cholesterol levels near to normal, as in the case of Garcinia cambogia treated rats.14 The low lipoprotein lipase activity in the liver may be responsible for the low degradation of lipoprotein, triglycerides and cholesterol. Hence, the hyperlipidemic effect of dexamethasone was found to be reversed by co-treatment with CP-1, CP-2 and CP-6; furthermore, the anti-hyperlipidemic effect of CP-6 was comparable with Atorvastatin (10 mg/kg p.o.). It is thought that CP-1, CP-2 and CP-6 are acting as anti-hyperlipidemic agents by inhibiting the biosynthesis of cholesterol and triglycerides and therefore can be used for the prevention (prophylactic) of hyperlipidemia; however, the drug-drug interaction of CP-1, CP-2 and CP-6 with dexamethazone and Triton WR-1339 can not be neglected and hence it may be a limitation of the present study. In this context, further studies are in the pipeline to evaluate the possible pharmacokinetic and pharmacodynamic interaction of different doses of CP-1, CP-2 and CP-6 with dexamethasone and Triton WR-1339. Since the findings are novel and preliminary, further studies need to be conducted to confirm the safety profile on vital organs and their functions and explore the molecular mechanism behind the hypolipidemic effect of CP-1, CP-2 and CP-6. These preliminary findings suggest that the newly synthesized triazine derivatives CP-1, CP-2 and CP-6 possess significant anti-hyperlipidemic activity against experimental animal models of hyperlipidemia. The authors are thankful to Prof. Dr. S. Mohan, Principal and management members at P.E.S. College of Pharmacy for providing all the necessary facilities to carry out the research work. No conflict of interest was declared. 2. McKenney JM. Dyslipiemias. In Applied Therapeutics, 7th ed. ; Koda-Kimble, M.A., Young, L.Y., Eds. ; Lippincott Williams and Wilkins: Philadelphia, PA, USA, 2001; pp. 11:1–11:43. 3. Libby P, Schoenbeck U, Mach F, Selwyn AP, Ganz P. Current concepts in cardiovascular pathology: the role of LDL cholesterol in plaque rupture and stabilization. Am J Med 1998 Feb;104(2A):14S-18S. 4. Martin MJ, Hulley SB, Browner WS, Kuller LH, Wentworth D. Serum cholesterol, blood pressure, and mortality: implications from a cohort of 361,662 men. Lancet 1986 Oct;2(8513):933-936. 5. West KM, Ahuja MM, Bennett PH, Czyzyk A, De Acosta OM, Fuller JH, et al. The role of circulating glucose and triglyceride concentrations and their interactions with other "risk factors" as determinants of arterial disease in nine diabetic population samples from the WHO multinational study. Diabetes Care 1983 Jul-Aug;6(4):361-369. 6. Santhosh Kumar VR. Md. Naseeruddin Inamdar, Nayeemunnisa, Viswanatha GL. Protective effect of lemongrass oil against dexamethasone induced hyperlipidemia in rats: possible role of decreased lecithin cholesterol acetyl transferase activity. Asian Pacific Journal of Tropical Medicine 2011;8:658-660 . 7. Viswanatha GL, Janaki Priyadarshini B, Nandakumar K, Saravanan J, Srinath R, Shylaja H. Synthesis and antihistaminic activity of 3H-benzo [4,5] thieno [2,3-d][1,2,3] triazin-4-ones. Saudi Pharm J 2011. doi:10.1016/j.jsps.2011.05.005. 8. Gewald K, Schinke E, Bohcher H. 2-Aminothiophene aus methylenaktiven nitrilen, carbonylverbindungen and schwefel. Chem Ber 1966;99:94-100 . 9. Samia M, Julie EB, Paul MR. Response to Letter Regarding Article, "Fasting Compared With Nonfasting Lipids and Apolipoproteins for Predicting Incident Cardiovascular Events. Circulation 2009;119:e385 . 10. Movahedian A, Sajjadi SE, Ahmadi M. Lipid lowering effect of aerial parts of Peucedanum pastinacifolium Boiss. and Hausskn. hydroalcoholic extract in hypercholesterolemic rats. Iran J Pharm Res 2009;8:301-306. 11. Schurr PE, Schultz JR, Parkinson TM. Triton-induced hyperlipidemia in rats as an animal model for screening hypolipidemic drugs. Lipids 1972 Jan;7(1):68-74. 12. Adeneye AA, Adeyemi OO, Agbaje EO. Anti-obesity and antihyperlipidaemic effect of Hunteria umbellata seed extract in experimental hyperlipidaemia. J Ethnopharmacol 2010 Jul;130(2):307-314. 13. Howard-Alpe GM, Sear JW, Foex P. Methods of detecting atherosclerosis in non-cardiac surgical patients; the role of biochemical markers. Br J Anaesth 2006 Dec;97(6):758-769. 14. Mahendran P, Devi CS. Effect of Garcinia cambogia extract on lipids and lipoprotein composition in dexamethasone administered rats. Indian J Physiol Pharmacol 2001 Jul;45(3):345-350. 15. Shalam. Md, Harish MS, Farhana SA.Prevention of dexamethasone- and fructose-induced insulin resistance in rats by SH-01D, a herbal preparation. Indian J Pharmacol 2006;38:419-422 . 16. Kumar BR, Praveen TK, Nanjan MJ, Karvekar MD, Suresh B. Serum Glucose and Triglyceride lowering Activity of Some Novel Glitazones Against Dexamethasone-induced Hyperlipidemia and Insulin resistanance. Indian J Pharmacol 2007;39:299-302 . 17. Kumar V, Singh P, Chander R, Mahdi F, Singh S, Singh R, et al. Hypolipidemic activity of Hibiscus rosa sinensis root in rats. Indian J Biochem Biophys 2009 Dec;46(6):507-510. 18. Kumar S, Kumar V, Prakash O. Antidiabetic, hypolipidemic and histopathological analysis of Dillenia indica (L.) leaves extract on alloxan induced diabetic rats. Asian Pac J Trop Med 2011 May;4(5):347-352.